She’s reaching for a breakaway pass. Dana Campbell has spent the past seven years in self-imposed isolation for a crime she didn’t commit. The danger is well in the past, but her panic attacks make it impossible to have a normal, healthy relationship with a man. Even her counselor has given up on her. She has to find someone she trusts to help her fight through the panic, or her seven-year ordeal will become a lifetime sentence. There’s only one man she feels safe enough to ask. He got caught with his head down. As the captain of the NHL’s once elite but now fading Portland Storm, Eric Zellinger knows a thing or two about keeping his focus on the job. Questions are flying about his ability to lead the team back to the playoffs. If they don’t make it, he might be shipped out of town. It’s the worst time possible for his best friend’s kid sister to divide his focus. How can he give her what she needs without jeopardizing both the Storm’s playoff hopes and his future with the team? It’s her only chance, but it’s his last shot. I've got to be honest-I really have no idea why I one clicked on this free book because I generally don't go for the tropes where the heroine is overcoming a horrible thing in her past and becomes strong again due to love. 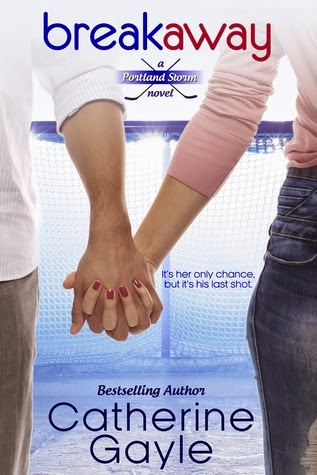 However, I follow the author on twitter, and have been wanting to try something from her for awhile, and the hockey part of the story line drew me in because I love romances with sports in them. I was unprepared for how much I ended up loving this book. I loved that it was told in first person pov from both Dana and Eric. When one got to be too much, it would switch to the other and it created a nice flow and made me root for each one of them to get what they wanted. Dana's story is heartbreaking and inspiring at the same time. I liked that Dana was afraid, yet determined to take charge of her life after it was ruined. She was so strong, yet vulnerable at the same time. I loved how she wanted Eric, yet was scared to death at the same time--it just made the story so real. It was painful at times to watch Dana struggle with her feelings and not being able to get close to Eric like she wanted to. Eric was wonderful. He took things slow and didn't try to rush Dana too much. I loved watching his conflicts both with her and his career. The hockey scenes were great. I loved that there were actual games and that it wasn't glossed over like in so many sports novels. You can tell that the author is really a fan of the sport-her love shines through the writing. The secondary characters were just as lovable as Eric and Dana. Jamie Babcock, or Babs as he's known throughout the books, who is Eric's roommate, was a scene stealer. He was adorable, and made me laugh out loud a lot. I can't wait to read his novella, which releases today. Dana's older brother, Brenden was just as enjoyable as Babs. I loved how even though he was best friends with Eric, he still gave him crap about dating his sister after everything she'd been through. He was understandably overprotective of her. What I also enjoyed was that this was a great beginning to a new series, yet the romance wasn't lost in order to introduce future story lines-nothing annoys me more then that. All in all, I'm really glad that I took a chance on this book and can't wait to read more by this author. This is honestly the best freebie I've ever gotten from amazon.